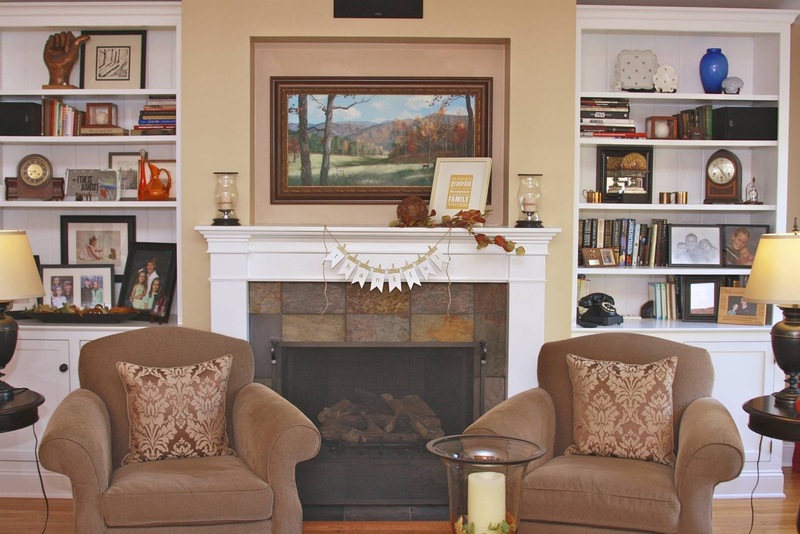 I just love to change out our home decor to reflect the seasons. 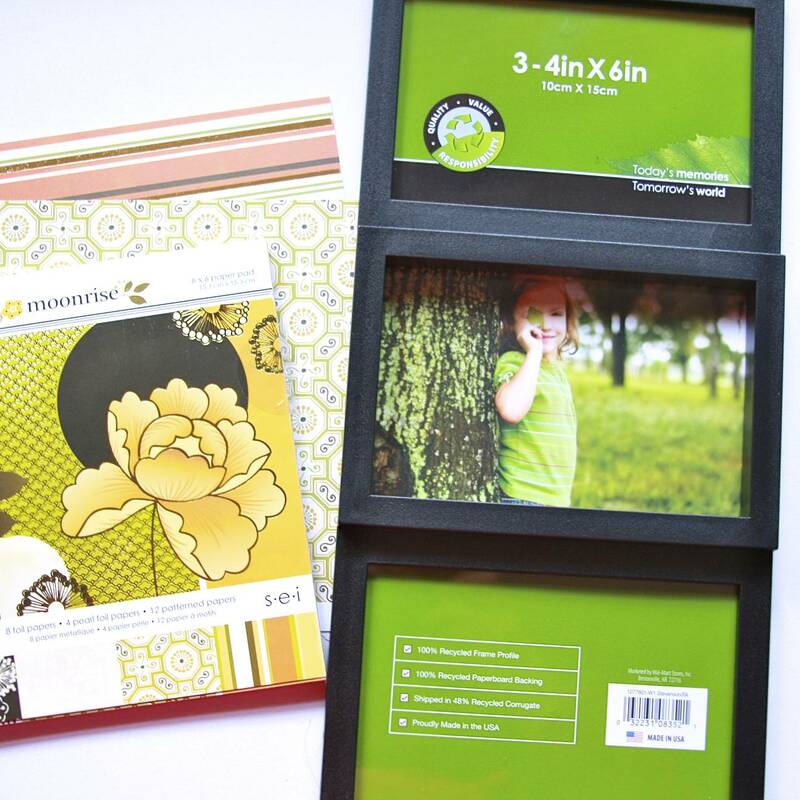 I shopped my stash to find this paper pack that had some beautiful fall-ish tones, but could also pass for spring-ish tones, too (for our friends Down Under). Much to my surprise, I did not have a frame in my stash, so ended up purchasing this frame, but it was only $3.oo. Trim the paper, insert into openings and it's finished. But, wait. How about some word art? 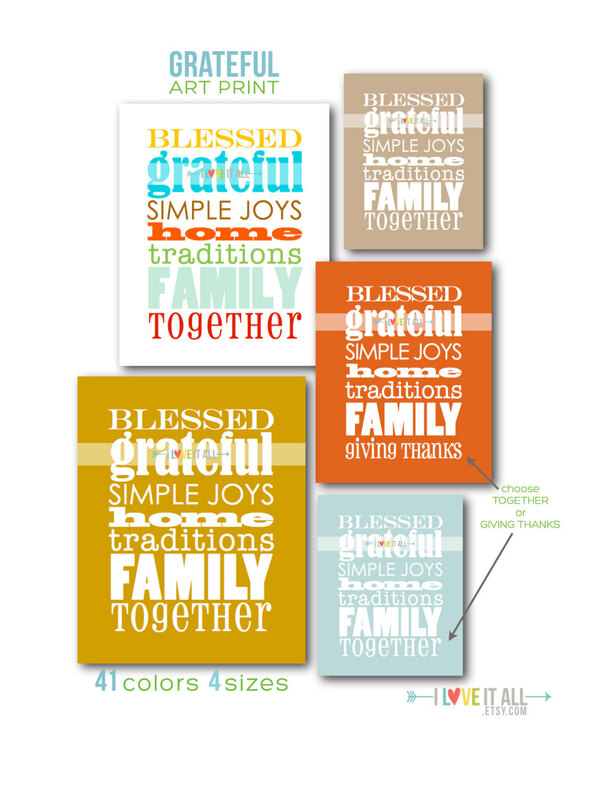 The 'thankful' word art download is available in the download section in my sidebar, or go here. Wondering why there are two sizes? The frame manufacturer cannot measure...those are NOT 4x6 openings! So, if you happen to purchase the same frame I did, the second print is a perfect fit for the frame I purchased at a place I will not name. Three versions, you decide which is your favorite. 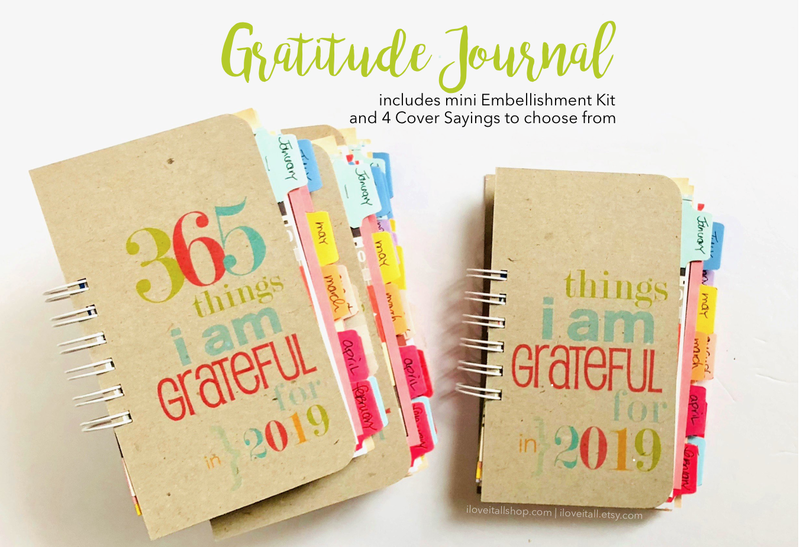 UPDATE: find the newest GRATITUDE JOURNAL here and more mini books. I'll admit that there are days that challenge me. Challenge me to be as good as I can be. To be thankful for the blessing of another day even when I feel that everything has gone wrong and that I've not lived up to my full potential. For this very reason, I created a project that I'll share that makes me stop for a few moments each day to think about one thing or moment or deed that I felt grateful for on that particular day. I've been writing in my journal every day since January 1 of this year. And the small act of stopping to reflect upon my day, each and every day, makes me realize that each day IS a gift. 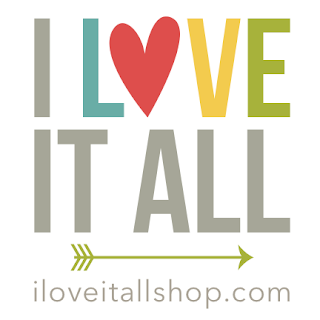 I'm back today sharing ways to chronicle what you are thankful for in your life. 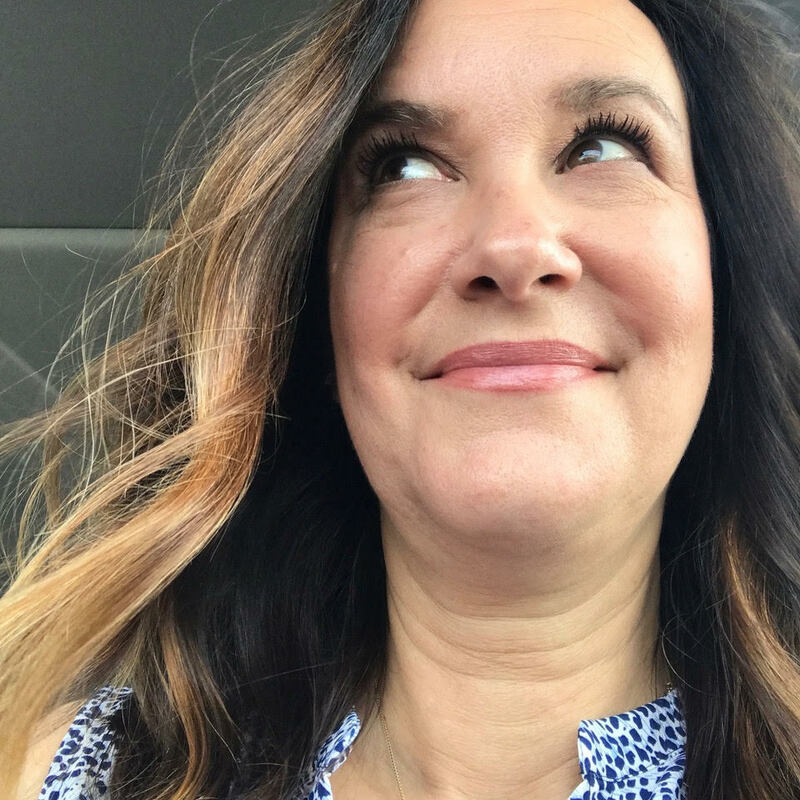 Grab your coffee and spend a few moments with me, won't you? 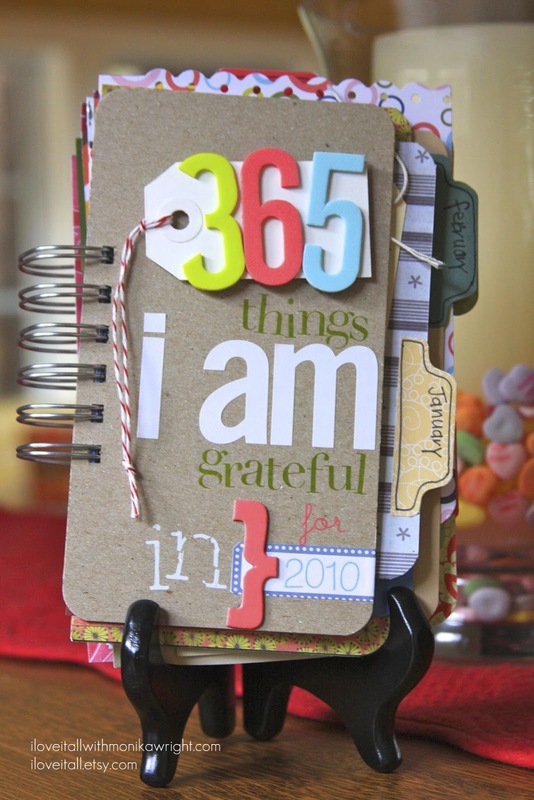 Here is my 365 things I am grateful for in 2010 journal I told you about. Seeing this out on my craft desk makes me smile. Makes me want to look back and read what I've written. And provides me with incentive to pick it up and reflect upon my gratitude for this day. I literally went through my scrap bin searching for papers that were large enough to write on. 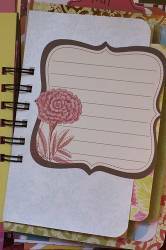 I pulled out my tab punch for the months and various journaling spots, mismatched letter stickers, and rub-ons and went to town creating and embellishing my journal. 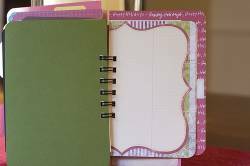 I thought if I made this journal appealing to the eye, I would feel badly if I didn't actually use it, especially since I had used so many cute embellishments and papers. Here's a peak at some of the interior pages before I started recording my thoughts. See what I mean? 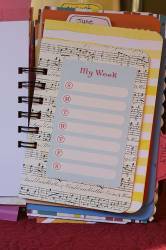 Who wouldn't be compelled to use this fun journal to record a grateful thought per day. 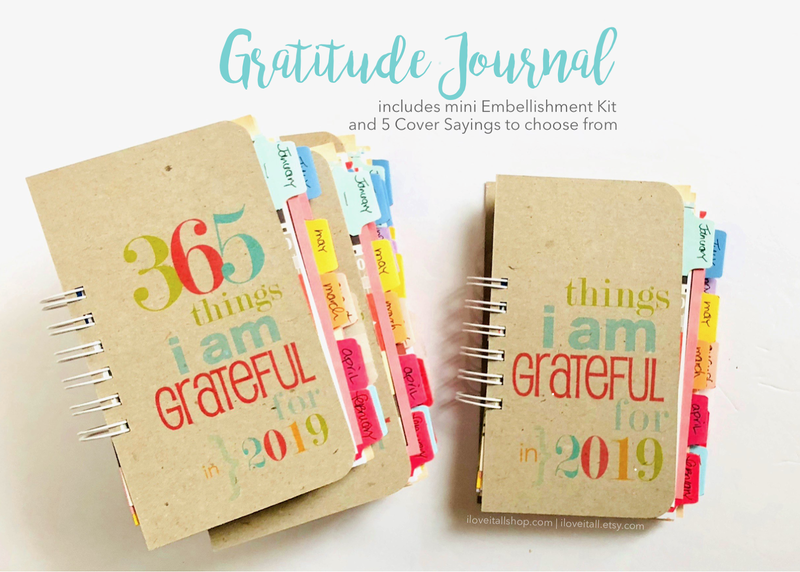 Due to customer demand, I've even added lined pages Gratitude Journals to the shop for those that need even more room to write. I want a Gratitude journal of my own. Today's roundup has a smorgasbord of treats to tempt you! I don't know of a way to celebrate the gathering of family and friends around a bountiful Thanksgiving table, without sharing a few favorite recipes. On Thanksgiving Day, at least in the United States, there's going to be talk of football, the weather and food. I firmly believe that's there's no better recipe in the world than one that's been shared by a friend or family member. I apologize right now for any weight gain that might occur during the testing of the recipes I'm about to share! 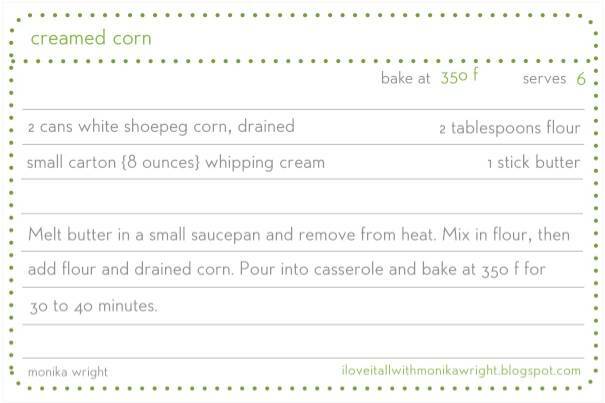 This recipe for creamed corn is simple, simple, simple and it's equally as delicious with your Thanksgiving turkey as it will be with your Easter ham. Yummy! And now for your free download to create your own recipe cards, click here or for this and other free downloads, you can visit the downloads section in my sidebar. 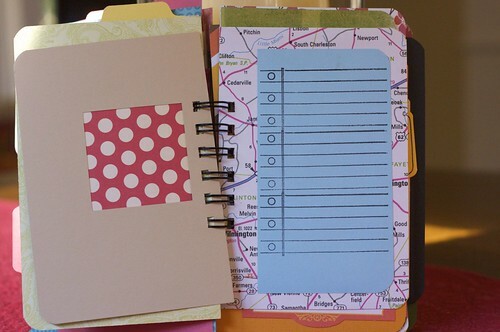 I created my little mini-journal with this free download I designed. Although I ended up trimming my pages shorter than how they print out, the design allows you to make yours suit your own design needs. 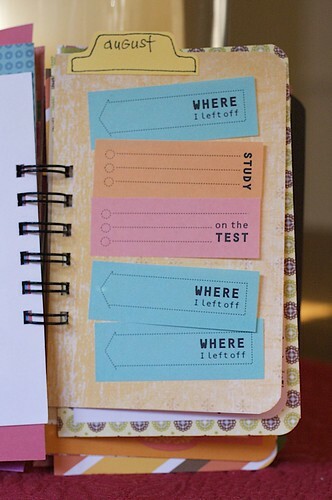 The small paper strip behind the cover embellishments is the same paper I used for the inside pages. I used some shipping twine, punched a few small holes in some felt leaf embellishments I had on hand and used a "10" sticker (for the year 2010) to adorn the front cover. 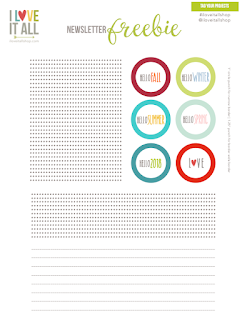 I printed enough pages for each person at our Thanksgiving gathering to reflect upon what they are thankful for. To coax the guys into participating, my plan is to have my girls take the journal to each person with a marker and ask them to write something. It's harder to turn down an adorably precious little girl than to turn down their Mother. Just sayin'! A little something to keep you busy until tomorrow. 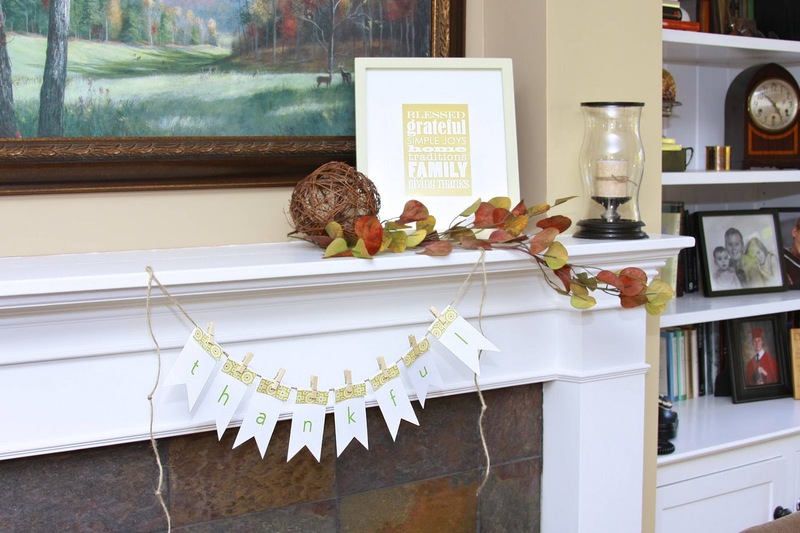 Back again, sharing more ideas to keep you in the thankful frame of mind. Today we'll be preparing our home for that big day. Decorating the mantle. Preparing the place cards. Let's see, what else could there be to do? A. LOT. But, I'll leave the rest up to you. Remember the download I used yesterday to create this 'thankful for' mini-album? We're going to use that same download again today to craft the place cards you see below for your holiday table. I printed my download onto kraft paper. 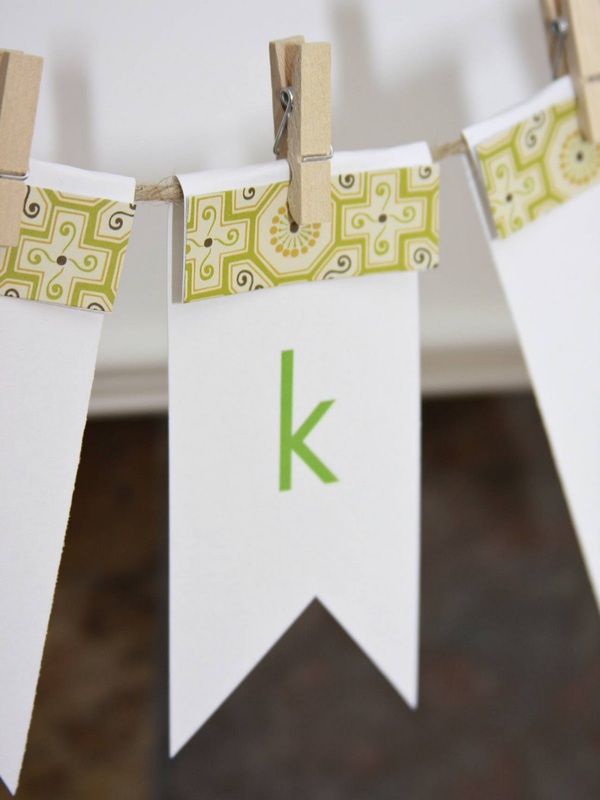 You might notice that I cut each of the place cards to different heights to show you the versatility of this download. For the first place card, I rounded just the top two corners, used my label maker, a small scrap of patterned paper and a felt flower. For the second one, I rounded all four corners, punched a heart and used a pop dot, some letter stickers, another scrap of patterned paper and a punch so that I could thread some twine through and tie off a square knot. For the third card, I rounded just the bottom two corners and used my paper scraps to add a border strip across the top and punch some butterflies. I then used a small tag and attached it with a grommet. See that banner hanging from our mantle? That's what we're going to make next! After printing your free download, trim on the lines provided. I used the same patterned paper I've used all week, this time to embellish the part of the tag that I folded over the twine I am using to string my banner. To add just a bit more cuteness, I cut into the tag in an inverted V pattern. (Does that line have you thinking of Tom Cruise in Top Gun explaining his gutsy maneuver while fighting off those pesky MiGs?...sorry, back to our regular programming.) 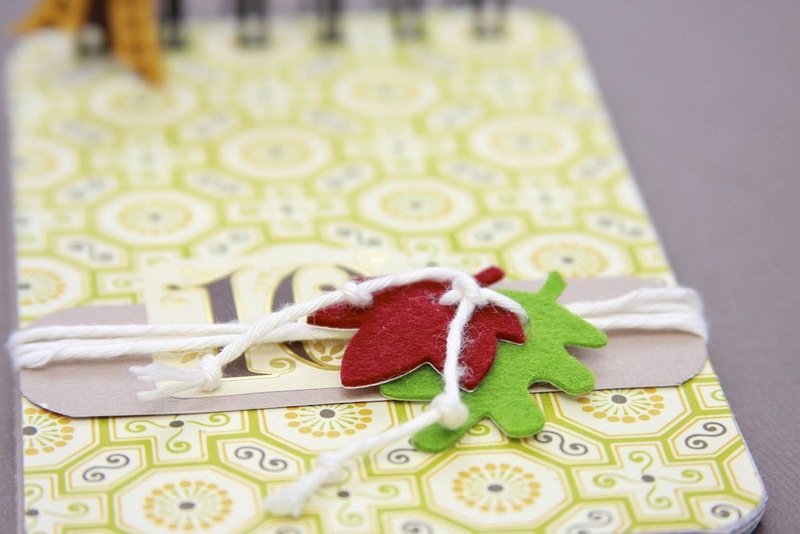 Now fold your pennant over your twine, or ribbon, or even raffia...wouldn't that be cute and attach it with a mini clothespin. 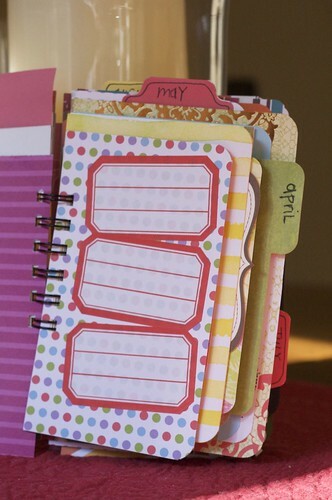 You could also use your adhesive to hold it in place, or a colored staple. As another alternative, use your Crop-o-Dile and a grommet. ps. have that frame! thanks for the heads up about the size. Hi! I like your journal idea. 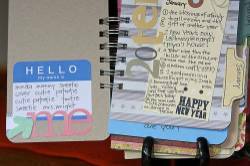 Do you use like 10 pages each month or more or less? Just trying to figure out how full it is! Thanks!! Thanks so much for letting me link this post up at Tip Junkie! Great ideas! I have all this scrapbook paper... now I have to put it to good use! ^^ Thanks!